Found in FNA Volume 24. Treatment on page 117. Plants cespitose, not rhizomatous. Culms 30-250 cm tall, 2-3 mm thick, glabrous, smooth; nodes 1-3. Basal sheaths glabrous or the margins ciliate, becoming fibrous with age; collars glabrous, including the sides; basal ligules 1-3 mm, membranous, glabrous, truncate to acute; upper ligules to 12 mm, acute; blades to 60 cm long, 2-5 mm wide, abaxial surfaces smooth, adaxial surfaces scabrous. Panicles 12-50 cm long, 4-15 cm wide; branches ascending, usually whorled, longest branches 2.5-15 cm, with 15+ spikelets. 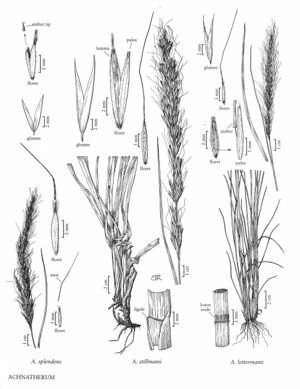 Glumes 4-8.5 mm, acute; lower glumes 0-1.7 mm shorter than the upper glumes; upper glumes 0.5-0.9 mm wide; florets 4-7.2 mm, fusiform; calluses 0.3-0.5 mm, blunt; lemmas evenly hairy, hairs at midlength to 1 mm, apical hairs to 1.5 mm, apical lobes 0.5-1 mm; awns 5-12 mm, readily deciduous, indistinctly once-geniculate or flexuous, scabrous; paleas slightly shorter than the lemmas, pubescent; anthers 3-4.5 mm, dehiscent, penicillate, yellow. Caryopses 2-4 mm, fusiform. 2n =42, 48. Achnatherum splendens is native from the Caspian Sea to eastern Siberia and south through central Asia to the inner ranges of the Himalayas. According to Freitag (1985), it is a common and typical plant of cold, semidesert regions, growing in groundwater-influenced habitats at elevations of 2100-3800 m. It is rarely eaten by grazing animals, so that it increases in abundance in overgrazed meadows. It is being considered as a potential soil binder for areas in Asia that are too cold for Chrysopogon zizanioides (L.) Roberty A.S. Hitchcock (1951) reported A. splendens to be "sparingly cultivated" in the United States. In view of Freitag's comments, its cultivation in North America should be discouraged. This page was last edited on 2 January 2019, at 21:20.